Of course, we've already seen an image from the upcoming August issue of V-Jump already, but it's always good to get more! First up, a preview of Digivolving Spirits Alphamon, who is out in a little over a week. We also get a small teaser for the recently confirmed HolyAngemon. The we get a preview of the upcoming tri. glasses, along with their Adventure styled wipes. After that we see a preview of another new wave of the Digital Monster Capsule Collection! These continuing onto series 5 is fantastic, and hopefully they keep coming. This time the lineup is Tsunomon, Elecmon, Kabuterimon, SkullGreymon, and Vademon. Like the prior sets, these are based on the original V-Pet artwork. They're scheduled for release in November. Then we get a password for owners of the 20th Anniversary Digimon Pendulum to get a special Copymon that will allow them to jogress to a new Digimon! The password is 480594 and it gets you Ophanimon Falldown Mode's Copymon, which will let you jogress with Raguelmon to get Ordinemon! Then we get a bunch of ReArise information, including what appears to be appearances by the Dark Masters, along with some Adventure items you can use to theme your DigiTown. We knew V-mon would appearing due to the fan vote from before the game is out, but now it appears he will be voiced by his actor from Digimon Adventure 02, Junko Noda. 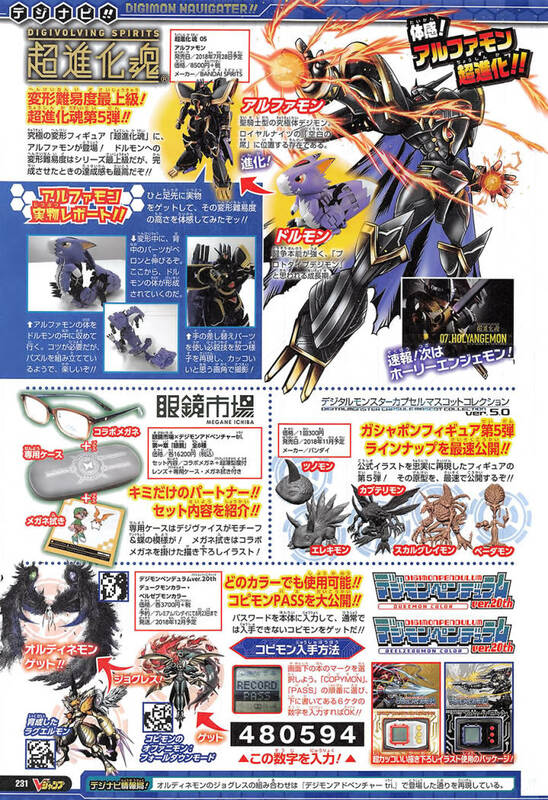 They finish off by showing Omegamon Alter-S in Digimon Linkz. Digimon Survive already has it's own thread, so you can find the scan there. Some great stuff in V-Jump this month! Thanks to a weibo user for the images. 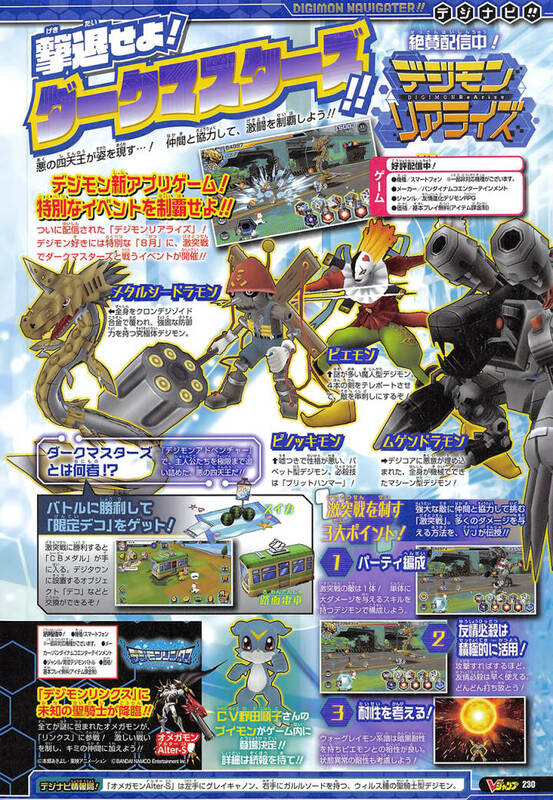 I see a preview for Digivolving Spirits 07 MagnaAngemon. That is so awesome. On hey, Bandai art of Ordinemon. Was kinda hoping for RagnaLordmon or Rafflesimon but I'm not gonna turn up my nose at this since she's only had her Toei art for some time. Worth mentioning how much do they care about ReArise even after its official launc date. I guess that means it has been really well received in Japan! Ordinemon is so small even in the normal size picture... Nice details and art style on those massive demonic wings. So glad Ophanimon Falldown Mode got released first! Now I can finally get an Ordinemon! Honestly I was expecting Stingmon to be the first one, can’t complain. Hopefully he and Bellestarmon will soon follow.